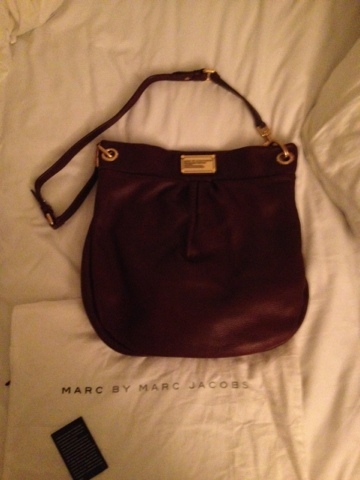 Marc Jacobs bag at “My Sister’s Closet” in San Diego… 2nd Time is a Charm! My friend LD was at the right place at the right time- My Sister’s Closet in San Diego’s UTC neighborhood– when she scored this luscious Marc by Marc Jacobs designer handbag at the fabulous price of $295. For sure, the second time is a charm! Here’s the story… LD was strolling through My Sister’s Closet, near closing time and in search of a pair of jeans. Like any smart shopper, she cruised by the handbags to check out the scene. She spotted the lovely Marc by Marc Jacobs dream handbag at the counter not even out on the floor yet. (right place, right time– bravo!) Being the smart shopper, LD knew a good deal when she saw it– and in turn scored a fabulous bag! This entry was posted in Consignment Shops, La Jolla, Re-Use Stuff, Retail Therapy and tagged designer handbag, marc by marc jacobs, Marc Jacobs handbags, My Sister's Closet, right place right time, shopping, style. Bookmark the permalink.